Margalea Warner is one of my partners, along with Carol Porch, for a Mental Illness Awareness Week presentation in October, Recovery: Rewiring the Brain. Margalea is active in the Mennonite Church in Iowa City. They have been supportive on her journey in recovery. She says there were some years when she was hospitalized so often she bankrupted their flower fund! This week I am reposting her recent contribution to ADNET, Anabaptist Disabilities Network. Margalea's story is one of those lights I hold up when things get dark. I hope it shines for you, as well. On August 12, 2012, a group of my friends gathered at the home of my friend Becky for a celebration of two major life milestones. My friend Sherry had achieved twenty-two years of being clean and sober. I had reached the milestone of seventeen years outside the locked psych ward. Years ago, Becky had invented the non-alcoholic drink contest to honor Sherry's years of sobriety. Each of the guests would bring their tastiest non-alcoholic drinks for Sherry to sample. Sherry would joke about accepting bribes and we would blindfold her so she wouldn't guess who brought which beverage. She would sniff each cup we handed her, sip one and then the next, swish them around her mouth and then pronounce the winners, starting with the last runner up (somehow the soy milk with cinnamon and cayenne pepper didn't rank very high) and culminating with the first place beverage. Over the years, we had so much fun with Sherry's ritual that I began to plan a ritual of my own. I decided keys would be a good image. The only visible difference between staff and patients on the psych ward, where all staff wear street clothes, was that the staff carried keys. Coming into a locked ward, one always passed the sign announcing "elopement precautions" -- I didn't have anyone to elope with anyway. So, anticipating the ritual, I started collecting castoff keys from my friends, along with prayers and blessings. 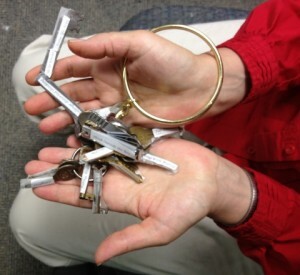 Some were house keys, others luggage keys, one car key (where is that car parked?). The three most unusual keys were from a friend who collects antique keys. My favorite key of hers is an 1870s-era hotel key: a long black key designed to make the keyhole harder to pick -- it folds in half to fit more easily in a pocket. Although I collected keys randomly, I ended up with exactly the seventeen keys I'd hoped for, to symbolize seventeen years outside the hospital. I put them all on a big round key chain that came with a whistle. The night of the party I brought the keys in a pretty metal tin with pictures of fruit on it that reminded me of the fruits of the spirit. I took the keys out and with each key read the prayers and blessings and testimonies people had given me. I felt it was a kind of witnessing. My fur person Chester couldn't be there but Becky's cat Trinket stood in for him as a feline spirit. After the party, two more keys from my godmother arrived: a skate key and a jewelry box key. I decided that together they stood for two short words that are of huge importance in my life. I'll add just one more note about what this woman has taught me about perseverance. She was teaching a Peer to Peer class that I took, and told us about Tai Chi. Somebody asked, Does Tai Chi relieve stress? Margalea's response, The first fourteen weeks were very stressful! Fourteen weeks! She said it got better after that. In my blog posting above, Willa added the comment that I found the first 14 weeks of Tai Chi class stressful. I am writing to clarify the challenges and rewards of Tai Chi. I wish instead of stressful I had used the word challenging. While it did indeed take perseverance, it wasn’t painful or beyond what I was able to do joyfully and receive as a gift. Part of that is because of the 70 percent principle. It was introduced during the first lesson with the commencement movement, which is to bring your arms from beside your torso up and forward, sending energy out. Our instructor told us not to straighten our arms ramrod straight but to only extend 70 percent of what we were able, leaving a graceful bend in the arms. Another 70 percent boundary is the break we take in the middle of our class time, allowing what we have learned to sink in. A less tangible application of this principle is not to take on more commitments than you can keep, which for me meant clearing my weeknight schedule of unnecessary meetings or duties. Emotionally this kind of 70 percent grace teaches us to be gentle with ourselves, to laugh more, and to be kind to others who we know are needing to stay inside their 70 percent as well. NAMI of Johnson County is in the dreaming and planning stages of organizing a recovery wellness center that would include space for Tai Chi and yoga classes. I would hate for another person like myself, suffering from psychiatric symptoms, to stay away from a Tai Chi class thinking it was too stressful. Fast food, gobbled down, makes you bloated, full and fat. But food savored slowly with friends is comforting and nourishing. Money spent too quickly is wasteful. Saving for something helps you reach your dreams. But calligraphy has grace and clarity. But slow deep chuckles are kind. (Massage therapist Laura says, “lymph loves laughter”). Careful questioning slows them to a halt. Protects body, mind and soul. Slow, deliberate Tai Chi postures bring peace and balance.